This essay is a chapter in the new book from AK Press We Are Many: Critical Reflections on Movement Strategy from Occupation to Liberation. The book is 450 pages with contributions from 50 authors — most of whom have been active in Occupy Wall Street. Order it here! Occupy Wall Street audaciously claimed to be a movement of “the 99%,” challenging the extreme consolidation of wealth and political power by the top one percent. Our opponents, however, claim that the 99% movement is little more than a handful of fringe radicals who are out of touch with mainstream America. They’re not 100% wrong about us being radicals. Radicals played pivotal roles in initiating Occupy Wall Street. And radicals continue to pour an enormous amount of time, energy, creativity, and strategic thinking into this burgeoning movement. What our opponents are wrong about is the equation of radical with fringe. The word radical literally means going to the root of something. Establishment forces use the label radical interchangeably with the disparaging label extremist—as a means to “otherize” the movement. But clearly the radicals did something right here. We flipped the script by framing the top 1% as the real extremists—as the people who are truly out of touch. By striking at the root of the problem and naming the primary culprit in our economic and democratic crises—by creating a defiant symbol on Wall Street’s doorstep—a new generation of young radicals has struck a chord with mainstream America. A movement that started as an audacious act by a committed core of radicals quickly and dramatically broadened its appeal. Radicals will likely continue to play a crucial role in this movement. Throughout history the radicals have tended to be among those who give the most of their time and energy to movements for change. They tend to make up a large part of the movement’s core. As such, their contributions are absolutely indispensable. However, successful movements need a lot more than a radical core. For every core participant who gives nearly everything of herself or himself, a strong movement needs a hundred more people in the next “tier” of participation—folks who are contributing something, while balancing other commitments in their lives. If we are to effectively challenge the most powerful institutions in the world (e.g. capitalism), we will need the active involvement of hundreds of thousands if not millions of people—folks who are willing to give something. If the core fails to involve a big enough next tier of participants, it will certainly fail to maintain effective engagement with the broader society. These “next tier” participants are not even the base, but rather the start of the base needed to accomplish our big-picture aims. If the kinds of changes we imagine are ever to be realized, it will be through the active participation of large numbers of teachers, nurses, factory workers, barbers, artists, service workers, students, military service members and veterans, religious communities, civic organizations, unions, and even some allies within the existing power establishment. These participants come as they are, and the core must welcome them as such. A broad-based movement cannot afford to have a high bar for entry. The smallest of contributions must be encouraged and affirmed. If we are to keep building a popular movement, we must accommodate a continuum of levels of involvement, as well as levels of political analysis. Occupy Wall Street got an impressive start in a very short amount of time. And our opponents took notice and kicked into a high gear counter-offensive. 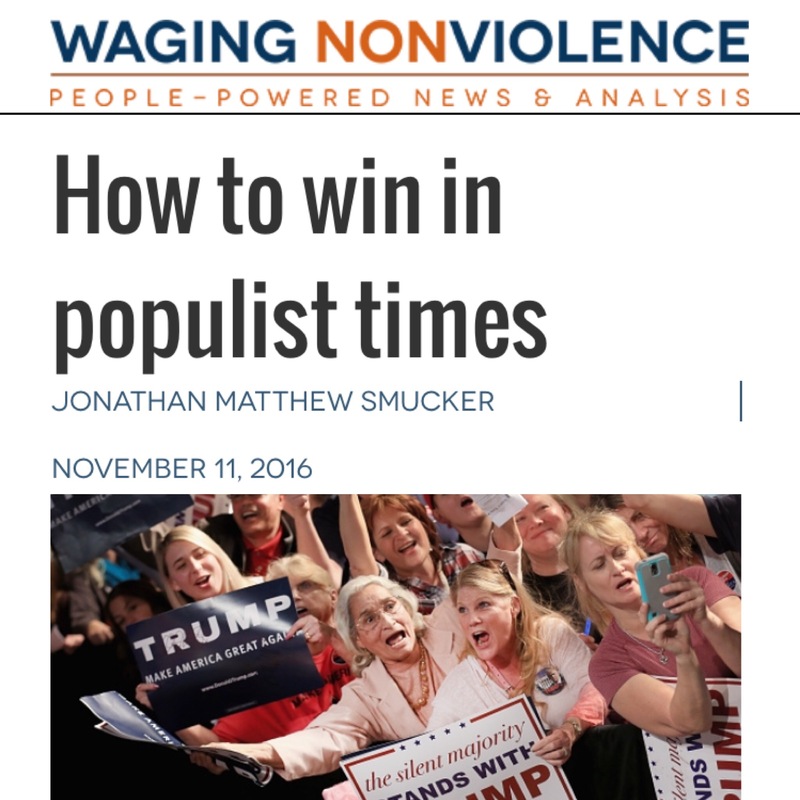 They will continue to do what they can to foment division between the radicalized core and the broader movement—because they know well that the dynamic-but-challenging relationship between core and broader base is one of the biggest strengths and biggest vulnerabilities of our movement. The successful interplay between these tiers of movement participants is of critical importance. Unfortunately, our opponents sometimes know this better than we do. Too often, radicals play into our opponents’ divide-and-conquer strategies, by relishing in our radical identity more than we value connecting with a broader base. Too often we get stuck in a story of the righteous few. However, this desire to separate ourselves from injustice can develop into a general mentality of separation from society more generally. In other words, when we see the dominant culture as a perpetrator of injustice, and we see society as the storehouse of the dominant culture, then our desire to separate ourselves from injustice can easily develop into a mentality of separating ourselves from the mainstream of society. With the mainstream seen as bad, we begin to look for ways to distinguish ourselves and our groups from anything mainstream. We begin to notice, highlight, exaggerate, and develop distinctions between ourselves and the mainstream, because these distinctions reinforce our radical identity. The distinguishing features go far beyond nonparticipation in those aspects of the dominant culture that we find offensive. Surely there were similar dynamics in play among radicals at Liberty Square and at other occupations across the country. The big danger is that radical subcultures caught in this pattern of emphasizing how different they are may, over time, start to even prize their own marginalization. If society is unjust, then our justice-oriented identity may be reaffirmed when we are rejected by society (or more accurately, by portions of society). If society is bad, then marginalization in society may be seen as good. We may tell each other stories of how we were ostracized in this or that group, how we’re the outcast in our family, how we were the only revolutionary in a group of liberal reformists, etc. We may start to swim in our own marginalization. This is the story of the righteous few. In the story of the righteous few, success itself becomes suspect. If a group or individual is embraced by a significant enough portion of society, it must be because they are not truly revolutionary or because their message has been “watered down.” It seriously messes with radicals’ heads when some of our ideas start to become popular! We are so accustomed to being the most radical kid on the block, and suddenly people we’ve never met are coming out of the woodwork, marching in the streets with us, and spouting some of the lines we’ve been saying for years. Frankly, it can lead to a bit of an identity crisis. Here we see the importance of checking our narratives for faulty components. If we allow the story of the righteous few to hold a place in our narrative about social change, then our efforts are likely to be seriously hindered by a general mentality to separate and distinguish ourselves from society and to retreat from success. To organize effectively, this mentality has to turn 180 degrees. We have to orient ourselves to connect with others, to notice commonalities, to “weave ourselves into the fabric of society” (quoting OWS participant Beka Economopoulos), and to embrace being embraced by society. For many radicals, this can be a big shift in our conceptualizations of ourselves and of our society. The good news is that we are presently deep into the process of making that profound paradigmatic shift. The framing of the 99% asserts an alignment of our vision with the interests of a supermajority of Americans. It encourages us to think of most everyone as a potential ally. The importance of this paradigm shift cannot be overstated. Over the past four decades radical social justice movements tended to feel like we were up against the whole culture. We began clustering into increasingly insular circles, looking to each other for support and connection, as if to hold onto our sanity in a world gone mad. We often felt entirely powerless in the face of so-called “free trade” agreements, austerity, raging wars of aggression, attacks on the gains made by earlier social justice movements (e.g. Civil Rights and feminism), ecological devastation, and many other setbacks. That’s part of what makes this moment so significant. OWS and the 99% movement have the potential to pull us out of a counter-cultural mentality and set us up to claim and contest the culture—our culture—rather than denounce, abandon, and distinguish ourselves from it. We are the 99%. We are the true moral majority. But we have a long road ahead. The meme of ”the 99%” can help to shift our thinking, but no meme is good enough to do all the work for us, without a conscious effort. While we continue to challenge the dominant storyline, we must also self-reflectively challenge some components of the narratives we tell ourselves about our relationship as radicals to the broader society. If we want to win, we have to scrap the chapter of the righteous few, and replace it with a story about everyday people—about huge swaths of society—stepping into movement together. The underlying economic conditions are politicizing more and more people by the day, creating greater potential for the emergence of a broader-based movement than we’ve seen in decades. And this moment needs the full participation and influence of radicals. Without radicals, this wave would lose its fire and settle too soon for too little. It must be pointed out that some establishment forces in the emerging precarious alignment—and all alignments are precarious!—will try to throw radicals under the bus first chance they get. But really it’s on us to make sure no one gets that chance. The way to do that is for radicals to get really good at making friends with a lot of people—to be the life of the party. It must be abundantly clear to tentative allies and opponents alike that it would be difficult to isolate us; that there would be a backlash if they attacked radicals. One thing not to do is shrink away from engagement with broader constituencies and unwieldy alignments, even including those who might betray us if they perceive they can get away with it. Such a retreat would make our fears self-fulfilling; would enable those who would screw us; would seal our fate as righteous martyrs whom the world was not ready for. Radicals have to ask ourselves if our radical identity confines us to be eternally rejected, ostracized, and crucified. That’s the story of the righteous few. The powerful are always ready to tell that story, and we must determine to not be a predictable character in their script. Serious radicals must decouple radicalism from such a martyr mentality. Serious radicals must aim to succeed. Fighting an advantaged opponent without a real intention and strategy for success is not so much fighting as it is coping. The tendency of the outgunned resister to run headlong, kamikaze-style, into enemy lines is the tendency of someone who wants to be righteous—not of someone who seeks to actually change the world. We must ask ourselves if our intention is to bring about meaningful change, or if it is to act out righteous narratives (either as individuals or in small enlightened groups). Fomenting a strong core—i.e. very active participants—is as essential for Occupy as it is for any social movement. There can be no serious social movement—the kind that challenges the powerful and privileged—without a correspondingly serious group identity that encourages a core of members to contribute an exceptional level of commitment, sacrifice, and heroics over the course of prolonged struggle. This kind of group identity has quickly, clearly, and strikingly emerged among core participants in OWS and occupations across the country and around the world. And that’s a good thing. However, this strong group identity is also something of a double-edged sword. The stronger the identity and cohesion of the core, the more likely we are to become alienated from other groups and from the broader society. We have to navigate something of a political identity paradox: our situation requires a strong internal identity in order to foster the level of commitment needed for protracted struggle; but this same cohesion tends over time to isolate the group, and isolated groups are hard-pressed to build the kind of broad-based power needed to achieve the big changes they imagine. Strong bonding within a group tends to create distinctions between groups—that’s true to an extent for all kinds of groups. However, it tends to have particular consequences for groups involved in oppositional political struggle. Consider a sports team that defines its group identity partly in distinction from rival teams. The team is likely to play all the harder against rivals as a result of the distinction. No problem there. A group engaged in challenging entrenched power, on the other hand—as the Occupy movement is doing—has not only to foster a strong internal identity; it also has to win allies beyond the bounds of that identity, if it is to build the collective power it needs to accomplish its goals. To extend the sports metaphor, if a movement group wants to score any goals, it has to see and value other groups as players on the same team, moving the ball in the same general direction. Add to this challenge that dynamics of oppositional struggle can quickly escalate this tendency toward isolation. Oppositional struggle can trigger an oppositional psychology amongst core participants, which can do a real number on a group. Movements that meet the kind of brutal resistance that the Civil Rights movement endured, for example, have quite a balancing act to perform. On the one hand, participants need to turn to each other more than ever for strength and support. They feel a compelling cohesiveness to their group identity in these moments of escalated conflict. On the other hand, they need to keep outwardly oriented, to stay connected to a broad and growing base. This is difficult to do even when core members are fully oriented to the task, let alone when they are unprepared, which is so often the case. Take, for example, Students for a Democratic Society (the original SDS that fell apart in dramatic fashion in 1969). At the center of the epic implosion of this massive student organization—underneath the rational arguments and accusations that leaders were slinging at each other—there was this political identity paradox. Key leaders had become encapsulated in their oppositional identity (or, rather, a few factionalizing identities) and they became more and more out of touch. They lost the ability and even the inclination to relate to their broader membership—a huge number of students at the moment of the implosion—let alone to the broader society. Some of the most committed would-be leaders of that generation came to see more value in holing up with a few comrades to make bombs than in organizing masses of students to take coordinated action. This is the tendency toward isolation taken to the extreme. Dedicated radicals cut themselves off, like lone guerrilla fighters in enemy territory. It might have felt glorious, but it was a suicide mission. The political identity paradox speaks to the need for OWS to develop both strong bonding and strong bridging. Without strong intra-group bonding, core participants will lack the level of commitment required for our serious struggle, and the support needed to hearten us in the face of state repression. But without strong beyond-group bridging, we would become too insular and isolated to be able to forge the broad alliances necessary for achieving big changes. Recurring manifestations of self-referential tactics, rituals, and rhetoric in OWS demonstrate this insular tendency. We have to perform an extraordinary balancing act between the conflicting imperatives of building a strong sense of identity within our core and connecting with allies and potential allies beyond the core. This balancing act will be more and more critical as the Occupy movement matures, as the core further develops a distinct culture, and as our opponents attempt to drive wedges between the movement’s most active participants and the broader society. Ten or twenty years from now, will we look back on Occupy Wall Street and see it as a blip, as a righteous stand that was predictably short-lived? Or will we see this as the moment when America rediscovered collective action—when a broad-based movement for social and economic justice was (re)born? Will we see it as little more than an interesting twist—a peculiar spike—in the otherwise predictable story of the righteous few? Or will we see it as a catalyst of a new moral majority that went on to change the course of history? Our long-term success depends on our skill in navigating the space between radical and mainstream, and between core and broader base; on our ability to foster strong internal solidarity, while also maintaining our orientation to connect with the broader society.